Though the disorders and infighting’s in the Syrian church affected the church, it stood firmly on the true faith under the Holy See, the Apostolic Throne of Antioch. But several lawsuits were filed against the Church. However the church was being protected by God’s grace. A managing committee of 19 elected candidates headed by the Vicar now governs the church. The electorate includes all the male members of the parish, who have attained the age of 21 years. are only some of the Holy Fathers of significance and prominence who have stayed here during the past decades. The visit and the Holy Mass by H.B. Thomas Mar Divannasios, the Kandanadu Diocesan Metropolitan and the president of the Holy Episcopal Synod gave a new enlightenment to the parish. The visit of the three Metropolitans H.B. 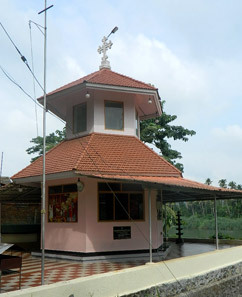 Thomas Mar Divannasios, H.G Thomas Mar Thimothios (Diocese of Kottayam and outer Kerala), H.G Joseph Mar Gregorios (Diocese of Kochi) on 2nd July 2000 is historically significant as far as this church is concerned. The "Holy Tri-Mass" offered by the three Metropolitans is a very memorable and blessed event in the history of this church. The CatholicoseHis Beatitude Aboon Mar Baselios Thomas I. and the newly anointed Metropolitans, H.G Markose Mar Koorilose, H.G Mathews Mar Ivanious were given a very warm reception under the auspices of the Kandanadu Diocese, at PiravomValiyapally, on 25th Feb.2001. A colourful procession of thousands of devotees with all pomp, and majesty accompanied the Metropolitans from the Seminary Premises to the PiravomValiyapally "ThandikaMaidan"
Fourteenth of April, 2012 is a red-letter day in the history of St.Mary’sJacobite Syrian Church, Piravom. The Church was elevated to a Cathedral as per Kalpana No.E.360/11 dated 23-12-2011 of HIS HIGHNESS MORAN MOR IGNATIUS ZAKKA 1 IWAS, Patriarch of Antioch and All the East, Supreme Head of the Universal Syrian Orthodox Church. It was on 14-4-2012 Saturday that the official declaration of the elevation of the Church was made at the time of Holy Mass solemnized on seven thrones by H.B. CATHOLICOS MOR BASELIOUS THOMAS FIRST and six other Metropolitans. H.G. JOSEPH MOR GREGORIOS, Secretary of the Synod and Metropolitan of the Kochi Diocese, H.G.DR MATHEWS MOR EVANIOS, Metropolitan of Kandanadu Diocese, H.G.GHEEVARGHESE MOR COORILOSE, H.G.ELIAS MOR JULIOS, H.G. ZACHRIAH MOR POLYCARPES and H.G. THOMAS MOR ALEXANDREOSE were the six Metropolitans who celebrated Holy Mass along with H.B CATHOLICOS MOR BASELIOUS THOMAS FIRST. More than 6000 devotees came to Holy Mass and participated in the feast that followed. The religious ecstasy of the parishioners knew no bounds. The Church Which is believed to have been established by the Magi, the three wise men from the east, Who Visited Infant Jesus and presented gifts will hence forth be known as RAJADHIRAJA ST.MARY’ S JACOBITE SYRIAN CATHEDRAL,PIRAVOM. The Cathedral is a pilgrim center, and it is no wonder that people from far and wide irrespective of their caste, creed or colour throng the Cathedral seeking succour solace and heavenly bliss. The parishioners have vowed to maintain their steadfast love and loyalty to the Holy Apostolic See of Antioch and All the East with renewed vigour and enthusiasm. Rev : Fr. Roy Mathews Meppadathu are now serving the Church. Mr.MathaiManappattu and Mr. MathaiThekkommottilare the present trustees. Mr. Abraham Joseph Penganamattom, who had been the trustee of this church for a long period of time, is exalted as Chevalier by H: H the Patriarch of Antioch. He is at present the Co-trustee of the MalankaraJacobite Church. Now, there are more than 10000 parishioners in the church, residing at, Piravom, Kakkadu, Onakoor, Pazhoor, Kalamboor, Peppathy, Veliyanadu, Ezhuppuram and other places around Piravom. The Parish Hall in front and to the right side of the church site is nearing completion with an expense of above Rs.2crore and with an area of 30,000 Sq.ft. It has shops and office rooms (about 26 Nos.) and the S.B.T Piravom branch functions in it with an occupation of an area of 5500Sq.ft. The parish hall which can accommodate 1500 people is erected with all modern facilities including "lift" and rooms for the Bhajana people are also made available. The urgent near future construction works of the church in the priority order. A modern erection of a cross at the bus stand. It will be an ever-adding beauty to the piravom town. The construction of the shopping complex at KaravatteKuriz. A palatial suite for Metropolitans and distinguished guests in the CHURCH CAMPUS. Special arrangements for the multitudinous devotees to attend the Holy Mass with out inconvenience, and without even touching the so sanctified church – building, which now stands up with priceless value. Казино максбет - живи без рамок. Ощутите как это быть счастливчиком: akadem-iap.ru.